Harman Kardon rolls out Soho headphones, Sabre SB 35 soundbar and BDS wireless systems | What Hi-Fi? There's a stack of new kit on the Harman Kardon stand here at IFA 2013, including stylish headphones, an ultra-thin BluetoothTV soundbar (claimed to be the world's thinnest, though the Sony HT-S3 has a claim in, too) and five multichannel audio systems with wireless Bluetooth/AirPlay/DLNA streaming. Available in white, black and brown, the headphones feature a leather headband and ear cups and stainless steel construction for "a premium finish". They fold flat to less than 1.25 inches (about 30 mm), and come with a choice of remote control straight microphone cables: a universal remote/mic for Android users, or an Apple iOS-compatible remote/mic for users of iPhone. A combined wireless loudspeaker and teleconferencing system. Available in white, black and beige, the Harman Kardon Esquire wireless speaker has custom-tuned microphones with noise-cancellation technology to enable hands-free conference calls from your Bluetooth-enabled smartphone, tablet or computer. Dual drivers and a built-in bass port are designed to make the most of your music. The Harman Kardon Esquire is supplied with a USB hub that enables three devices to be charged simultaneously, so you can power the speaker, a phone and a tablet all at the same time. The speaker also has a rechargeable battery delivering up to ten hours playback. 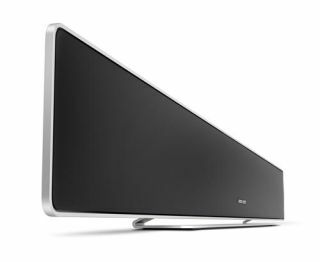 Harman says its objective in designing the Sabre was to develop "the thinnest soundbar on the planet". As a result, this 8.1 soundbar system is ultra-thin, measuring just 1.25in deep, while the wireless 100W subwoofer is equally slim at just 3.5in. The soundbar itself houses eight independent channels of amplification, driving a combination of six 1.75in drivers and two 1in tweeters. Multiple devices to be connected simultaneously via the three HDMI inputs, or optical digital and stereo analogue audio inputs, while the single HDMI output has ARC (Audio Return Channel). There's also Bluetooth wireless connectivity for streaming audio from smartphones, tablets and computers. Harman Kardon builds on its BDS range with the introduction of five new models which combine multichannel speaker packages with "state-of-the-art" electronics. The range comprises of three 5.1-channel systems based around the BDS 580 AV receiver and two 2.1-channel systems which use the BDS 280. As well as supporting playback of 3D Blu-ray, DVD and CD formats, the new BDS range offers a selection of wireless connectivity options, enabling video and audio content from other devices to be streamed through the systems. Built-in Bluetooth is enhanced with TrueStream technology, designed to give "the best possible streaming audio clarity", the company claims, while NFC (Near Field Communication) provides one-touch connection to your Bluetooth-enabled devices. Integrated wi-fi offers support for AirPlay, DLNA and vTuner internet radio as well as access to networked services such as YouTube, Picasa and AccuWeather. Owners of iOS and Android smartphones can also turn their mobile into a remote control by using the Harman Kardon remote app.